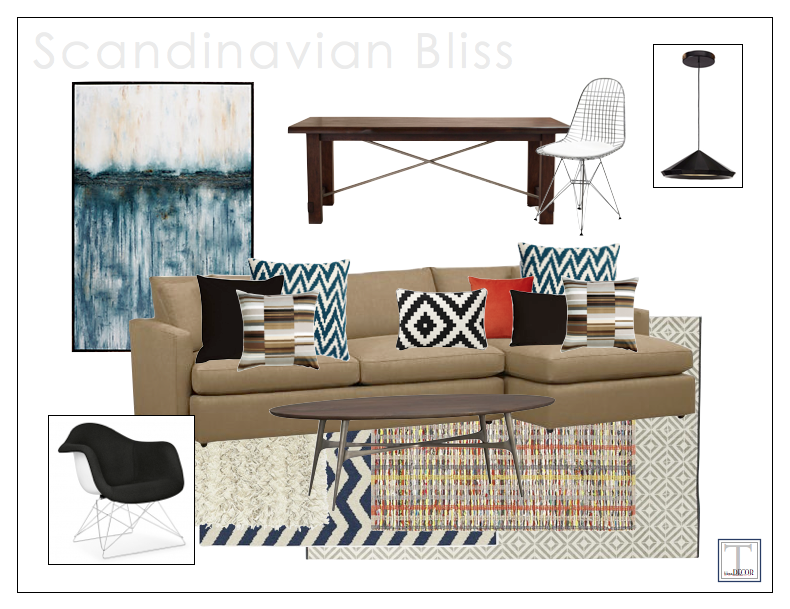 Today’s post is all about recreating the yummy Scandinavian-like feel of this interior. I’ve been in love ever since I saw it on Pinterest, and have been looking for some time to sit down and recreate some of it’s best features! I love the modern bohemian vibe that’s going on here – different textures and styles incorporated together to look cohesive and chic. It’s actually pretty easy to achieve the look by following just a few simple rules. 1. Choose a simple color palette (only one or two bold accent colors here). 2. Use one color to ground the whole darn thing. Here, cohesiveness comes from using the color black throughout the space – chairs, pillows, light fixtures, moulding. It helps all the other elements work together. 3. Layer texture and pattern (…especially in the rugs. Love that!). This works best when keeping the patterns small. Somehow things that would normally feel mismatched, work seamlessly together. Also, think about mixing up hard and soft surfaces. 4. Have fun! Don’t be overly concerned about “doing it right”. Have fun, and let the space reflect your personality! I love this! Love the look! So, I flipping love these posts, and being that we inspire each other, I’m kind of trying this out on Surrounded by Pretty. I hope it does yours justice!